Pictured above is an exposure of Prairie Grove Sandstone near Durham, Arkansas, southeast of Fayetteville. The ribbed, planar faces that are central in the photo resulted from a weathering phenomenon called zebra weathering. Zebra weathering occurs in sandstones cemented with calcite – a soluble mineral. Calcite is common in marine sediment and, in the tidal environment where this rock was deposited, marine sediment mixed with insoluble sand from the continent. The ratio of marine sediment to sand changed continuously in that environment due to seasonal and climatic cycles. Today, the beds of sandstone weather at different rates depending on their calcite content. As the rock weathers, the sandier beds stand out in relief since they wear away more slowly than the soluble beds between them. Hence, the banded zebra pattern. 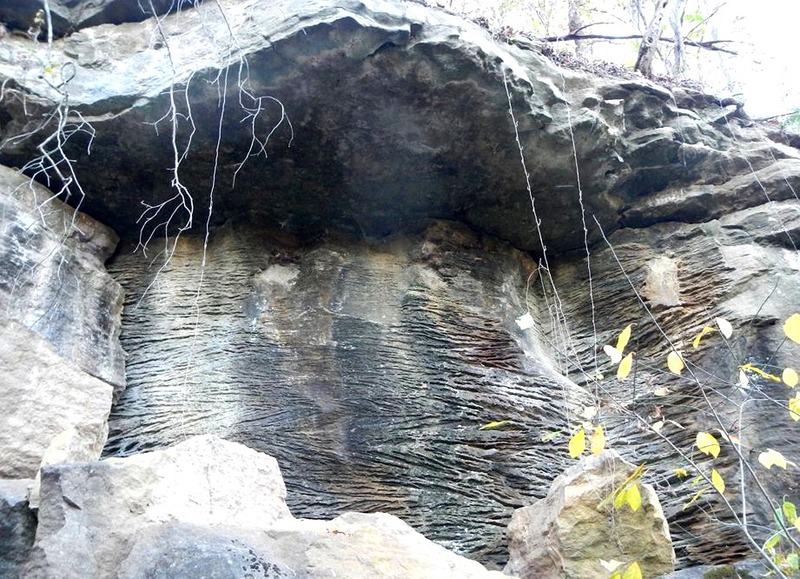 This entry was posted in #geoblog, GeoPic of the Week, Sedimentary Features and tagged Arkansas, calcareous, Calcite, Fayetteville, Geology, sandstone, zebra rock on November 18, 2016 by argeology.